Roses are one of the most highly symbolic flowers. Red roses are a favored gift for a lover. White roses are a traditional part of a bridal bouquet. Each American First Lady gets a rose named in her honor. Innumerable poets over the ages have made roses the symbol of love. Innumerable significant others have demanded rose bouquets as tokens of affection. And, consequently, innumerable crafty florists have seriously hiked the price of a traditional dozen rose bouquet. Fortunately, we now have the Internet. With the advent and boom of the online florist industry, many local florists have started advertising their flowers online as well. This makes price comparisons substantially easier, as well as giving you the ability to see a sample of the florist's work. Even with the Internet, it is extremely important to make sure you are getting good quality as well as a good price. The following steps will help you find the perfect bouquet at a wallet-friendly cost. If you have a finite price in mind, many online florists offer the option to search by cost. This can help you narrow the selection. If you are shopping for the best price without a definite boundary, remember to figure in the cost of shipping. 2. How formal is the occasion? For an anniversary or "I'm Sorry" flowers, you will want to get a formal bouquet. However, if you are just bringing someone flowers for a casual gift, consider your local supermarket or upscale supermarket. Choose flowers that are unbroken and without bruised petals. Try to get a packet of flower food as well. (The information desk or florist table should have them.) While not as formal as a florist's work, high end supermarkets do provide relatively high quality flowers and the plant food will prolong their freshness even further. 3. Do you want a bouquet of just roses or is a mixed bouquet acceptable? A bouquet of just roses will be more expensive than just about any other flower on the market. Sometimes, a purely rose bouquet is necessary. Sometimes, what you really need is a bouquet WITH roses. Look for a bouquet of mixed flowers and roses where the roses are the dominant blooms, meaning they are the showiest flowers in the bouquet, or the flowers to which your eye is immediately drawn. This achieves much of the same effect as a rose bouquet: you have the roses, you have the thoughtful floral gift, and you have additional flowers designed to highlight the beauty of the roses through complementary colors and petal types. 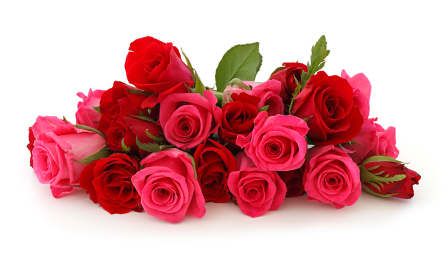 If you do need just roses at the lowest possible price, look into wholesale florists. Many sell online and will give you a per stem price, but they will require that you purchase a batch of a certain number. So, if a retailer offers lots of 20, you need to buy 20 roses. By and large, people do not object to extra flowers, and the price is far better than anything you will find in retail. Place the cellophane on a flat surface. Gently gather the filler flowers and ferns and place them on the cellophane diagonally, with their tops a few inches from the top corner of the cellophane. Place your roses on top of the ferns. Pick up the bottom corner of the cellophane and fold it over the bottom stems. Wrap the left and the right side of the cellophane around the stems. Put a bit of tape at the base of the cellophane "vase" to keep the flowers from unfolding the bottom. Tie your ribbon around cellophane on top of the stems, about 1/3 of the way to the bottom. Voila! You have created a bouquet that looks three to four times more expensive than it actually was.